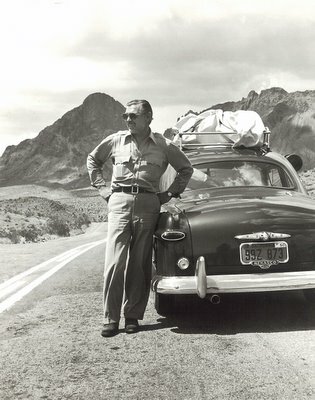 To commemorate Clark Gable’s 105th birthday, we’ve decided to join him on his thousand-mile road trip to film the big new Metro outdoor epic, Across The Wide Missouri, and we’ll be posting these updates on our progress as we head for the Colorado location with Clark. Well, first of all, here’s the car. Metro publicists described it as a "speedy gas buggy", but we’re going to defer to one of you experts among our readership to tell us just what make of a vehicle this is. Clark likes it fine, but we think maybe that stuff on the roof could stand to be secured a little better, as he’s prone to lean on that gas pedal from time to time --- ask any speed-cop back home in Encino. Clark’s happy to get away from the ball-and-chain for a while, even though she’ll be waiting for him when he gets to the location. Boy, was that marriage a big mistake --- all he remembers is those cocktails and that loud Hawaiian shirt she bought him just before they --- say, just where and when did that wedding happen? 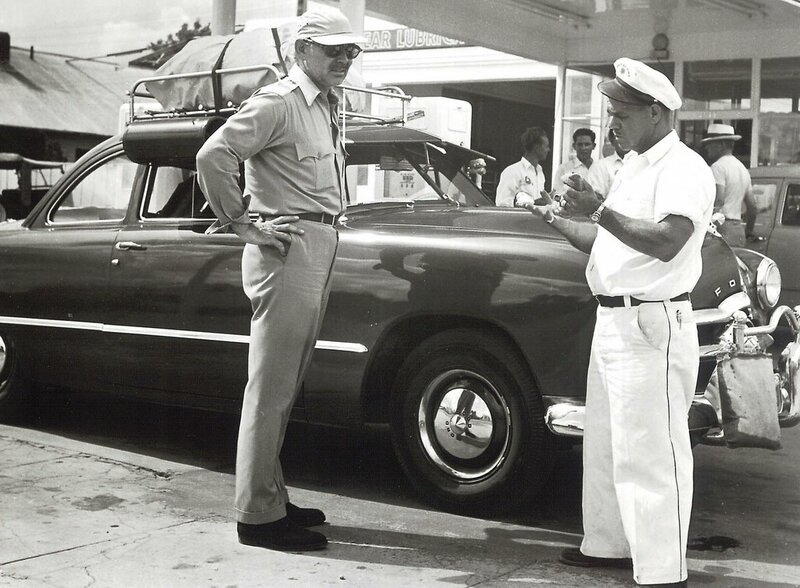 Anyway, we gotta stop for gas. Maybe Gary Cooper’s old trick will work at this station. He’s used it a thousand times. You fill up the tank, then you pay for it with a personal check. The gas jockey gets one squint at that bold signature and you can tell from his bug-eyes this check ain’t never going in with the deposit bag. Thanks for the free top-off, champ! We’ll do it again sometime. Just a little background here. 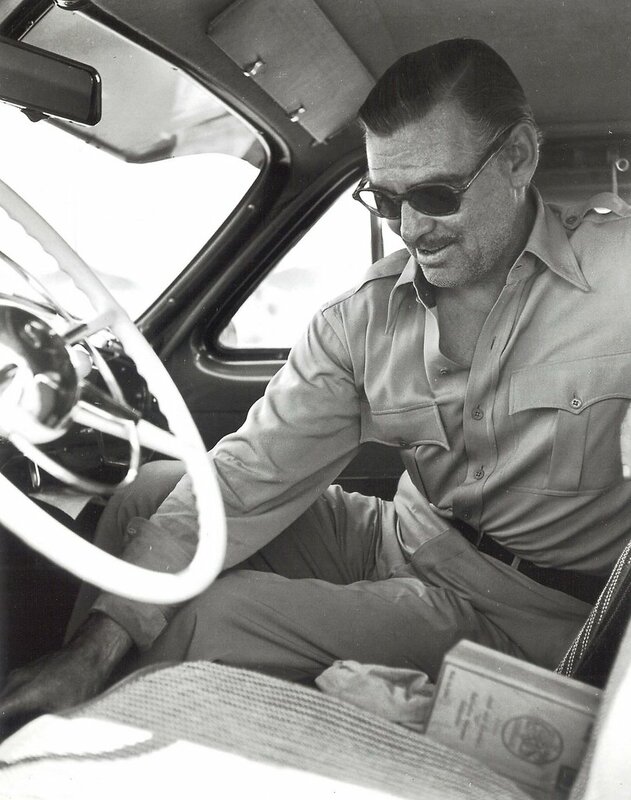 Clark Gable’s career at Metro was winding down at the time (1951) he made Across The Wide Missouri, surprisingly his first in Technicolor other than Gone With The Wind. His pictures were still profitable, but they were paying him upwards of $7500 a week, and it wasn’t easy finding suitable material for an aging romantic idol, especially with so many younger ones busting out of the starting gate after the war. Gable wasn’t happy either. He knew he was getting the short end at MGM. They’d passed on The Fountainhead for him a few years before, even though he’d expressed a desire to play it, and a proposed teaming with director Preston Sturges was scotched around the same time. Meanwhile, the pictures he was doing weren’t stirring up much excitement. New stars like Stewart Granger were on location in Africa doing Technicolor specials like King Solomon’s Mines, while Gable was back on the lot doing black-and-whites like Any Number Can Play and Key To The City. Not that his post-war pics are bad. I happen to like them a lot, but I think it’s safe to say the bloom was off the rose. On top of all that, Gable’s home life wasn’t so hot. He’d married, in haste (to repent at leisure), a woman who’d already scooped up several marital fortunes, including one from Doug Fairbanks, Sr. Her name was Lady Sylvia Hawkes Ashley Fairbanks etc. etc. (and forgive me if I’ve omitted a few). She was no Carole Lombard, that’s for sure, even though they say he married her because she looked like Carole. Well, you’ll get a chance to compare in Part 2. That’s when we arrive at the location for a good look at the new Mrs. Gable. Those stills are amazing. Talk about a guy not being able to hide his real emotions! One look at these and you’ll know why that marriage was kaput. Stay tuned. Was he still involved with Joan Crawford at this stage? I know they had a long standing affair. The car looks like a 1949 or 50 Ford coupe. Probably an old flat-head V8 stick shift. What puzzles me is the strange device hung out the right side window--an early air-cooler? Also note the water bag hung on the front bumper guard..must have been in case either the driver or car got overheated! Excellent. Where do you get all this stuff from? I am so glad that I found this site.Keep up the great work. The car in question is a 1949 Ford Deluxe Club Coupe. It has an optional grill guard and that large metal thing running above the windshield is an accessory Sun Visor. The luggage rack is an aftermarket add-on. My guess is that the car is red due to the fact that the steering wheel is white. Most black Fords had black steering wheels. This is also just a guess, but I would imagine Gable custom ordered this car from a LA Ford dealership and that there are some high performance "goodies" lurking under the hood. The 49 Ford was an all new design with it's smoothsided "shoebox" design. The car was a sensation when it first came out and it still influences car designers today. I'm sure Gabe was one of the first to get one. 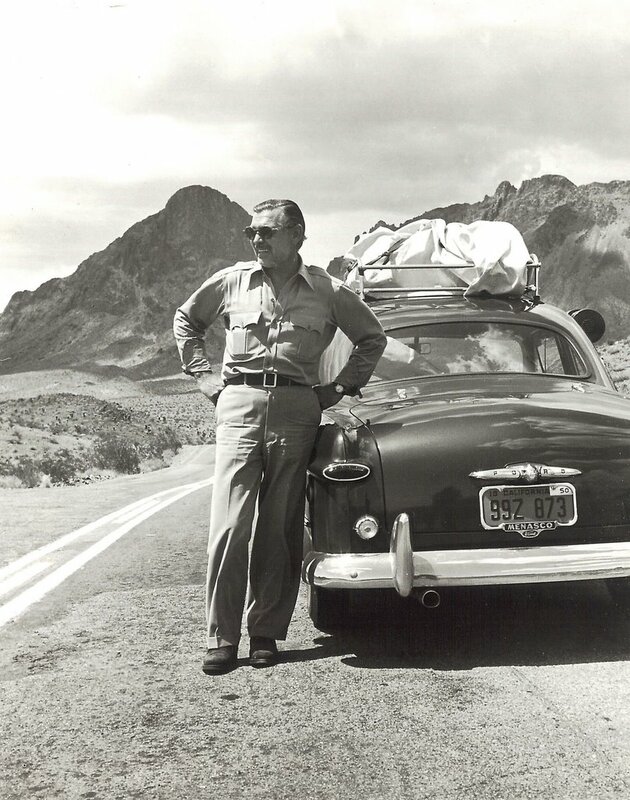 Five years later Gable owned one of the first custom "supercharged" Thunderbirds. Guess he liked Fords! Keep up the good work John. I'd love to see more "Stars and their cars" pix in the future.